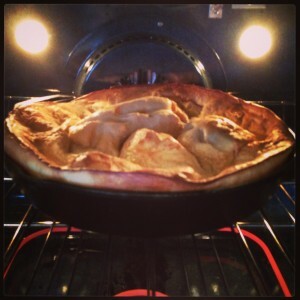 EAT YOUR HEART OUT #8: OVEN-BAKED SKILLET PUFF-PANCAKE. Let’s fast-forward to tomorrow morning… or even Sunday morning. Chances are, you might have someone lying next to you in bed. Whether it’s your husband, wife or even the stranger that somehow became your soul mate at 2:05am in front of the pub as they broke a heel or split their pants and tumbled to the sidewalk, I’m not here to judge. What I would like to do is let you in on a little breakfast treat that can quickly escalate you to HERO status. Normally when my mother-in-law, Elaine, comes to stay with us, she’s always good for leaving something behind. Sometimes it’s a pair of shoes, a phone charger or even a pair of Capri pants…but this time, she left something far more valuable. 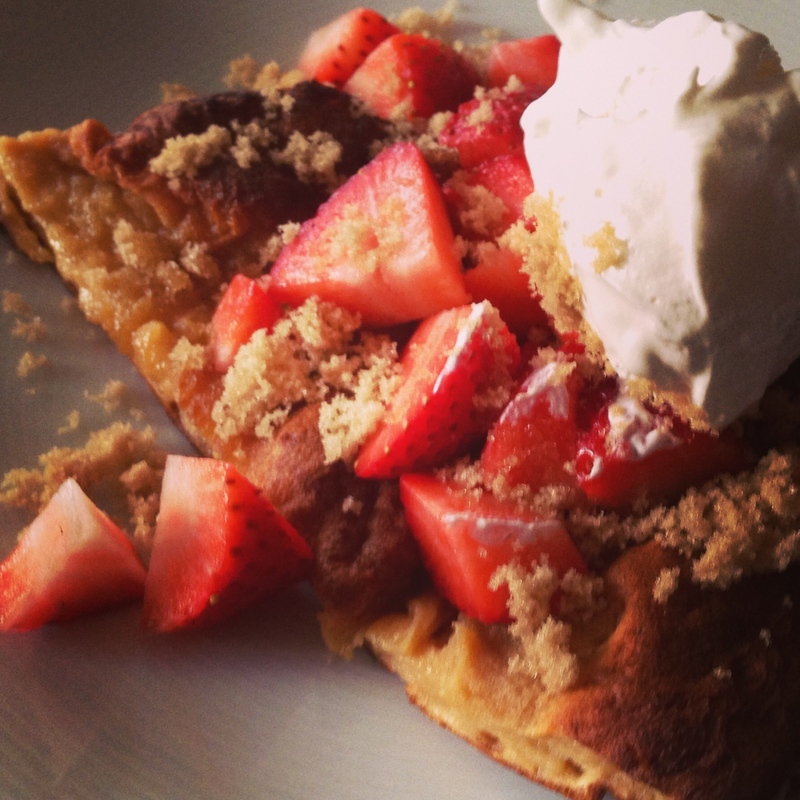 The recipe for an oven-baked skillet pancake. I use a cast-iron skillet and give it a quick spray of Pam around the bottom and edges. Add the 1/4 cup of butter and throw it in the oven (once pre-heated) until the butter is melted and almost bubbly. Beat your eggs, milk, sugar, flour and salt together in a medium-sized mixing bowl. DON’T WORRY, this thing will expand like a whoopie cushion gone wild. It’ll calm down once it’s out of the oven. After I pull the skillet from the oven, sometimes, I try and use and extra-large spatula to lift the pancake onto a cutting board, but you don’t have to. Cut it into wedges and plate. This breakfast literally takes about 30 minutes (5 minutes of prep + bake time) and the result is something that will either get you a second date or if you’re married like me, get you a few extra smiles throughout your day. Hope you guys have a great weekend and feel free to send me your pictures of how this turned out on my Facebook page! « DAD’S IN DEEP SH!T #28 – TEENY HOUDINI. My boyfriend started making these for me shortly after we started dating. He calls them Dutch Babies. I looove them with fruit and powdered sugar! He made them for my mom one weekend, and now she requests them for breakfast every time we stay the night.